Are you enjoying the flowers that are brightening up the city and the countryside? And the wonderful weather? They even are opening up the terrace at La Papoñita so that our 14:00 (2 pm) Sunday gatherings can enjoy the warmth. Chacra (farm) de Pilar. Driving instructions: North from Atlántida on Ruta 11 to Solis Chico road (very small sign high on utility pole); turn right. Pilar is the first turn on the left at the large wooden gate. Total distance from Atlántida is approximately 7 km. Before you reach the Chico Solis road, you will pass a building called Chinchilla on the right and the road will begin to climb. Chico Solis road is on the right part way up the climb. It is at km 159.3 of Ruta 11, but there is no sign. Monsurró Reparación de Calzado at 26 de Marzo 1240 esq. G. Pereira is a good shoe repair place. The best chocolate available here is might well be the Italian Pernigott, available both as dark chocolate or milk chocolate. Disco in Punta Carretas Shopping now has real coffee! As in beans that they can sell as is or grind for you. And their bags are stronger than Palacio del Café’s. Mercado Agricola is featuring Tango dancing every Wednesday from 20:00 (8 pm) until closing at 22:00 (10 pm). It is free, and you can also check out the place while you are there. It is located near the Parliament at Jose L Terra 2220 between José de Amezaga and Martin Garcia, and is open between 8 and 22 (8 am to 10 pm). 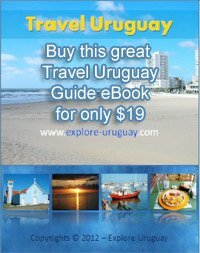 a) The XXVII Festival Internacional de Órgano del Uruguay! Here’s a link: http://www.eumus.edu.uy/eum/noticias/13/10/09/xxvii-festival-internacional-de-organo-del-uruguay-direccion-artistica-cristina. b) The Congregación Evangélica Alemana de Montevideo has scheduled a number of events on evenings in October. 17.10.2013 at 19:30 Concierto del Coro de Primaria de Colegio Alemán. For the FREE concerts, there are no tickets--just show up. However, the opera selections concert on November 13th at the Solis Theater costs pesos 150, and it is time to get the tickets, so if you want to join us, please respond by Monday, October 21.